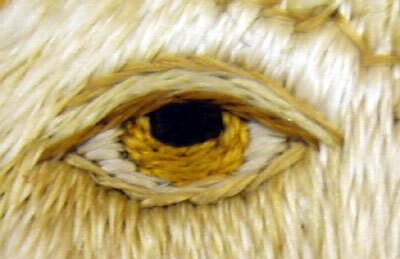 Here are a few more photos of embroidered eyes, this time on a few different animals. Some of these are “stylized” – that is, they are just representative of the particular animal’s eye, without being a perfectly natural reproduction of it. Still, you’ll notice the care and detail that goes into a realistic-looking eye, even if it is a bit stylized. There isn’t much difference in the techniques between these animals’ eyes and the embroidered faces and eyes that I showed you earlier (here and here). 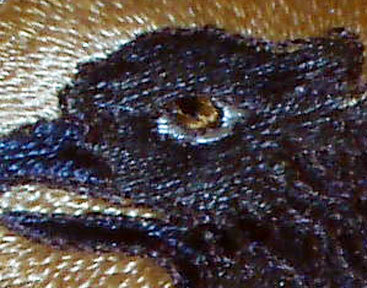 Besides noticing the eye, it’s interesting to note the amount of stitching in this bird’s body. The bottom layer may be padding created with yarn – it’s difficult to tell. In any case, it is padding (whether in bunches of yarn or a layer of stitching), as the bird stands out in relief from the background fabric. Over the padding, vertical long stitches are worked in a fine thread, which is then stitched over in long lines of split stitch, which are worked in the appropriate colors to provide shading. This is the eye of an eagle, stylized, but the eye itself is rather impressive, considering the head of the eagle is only approximately an 1.5 inches high (from neck to crown). 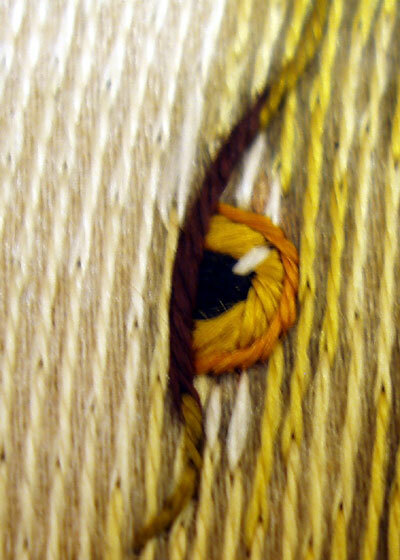 The variation in the color used in the iris – the light brown and dark brown, with two tiny stitches of white on the left side side – is delicate and detailed for something so small. 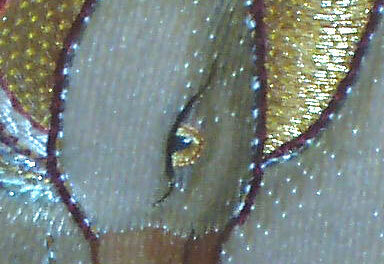 This last one is the eye of a lamb, whose head is in profile. It looks rather flat – there’s no variation in color and no glint. I have a feeling I’m the only one who finds these eyes so very interesting, but I hope that they come in handy for anyone doing any kind of figure embroidery, or even jacobean or crewel work, where animals are often part of the scene. One thing that I’ve learned from looking up close at this kind of work is to remember the glint! I am fascinated by this series of yours. 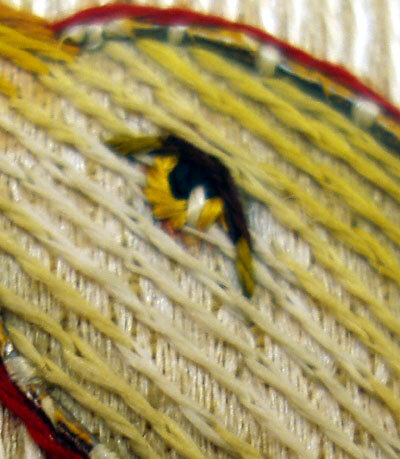 It illuminates the incredible mastery of technique that can be seen on old embroideries. I find it inspiring. I wonder tho, if you can identify some of these works.